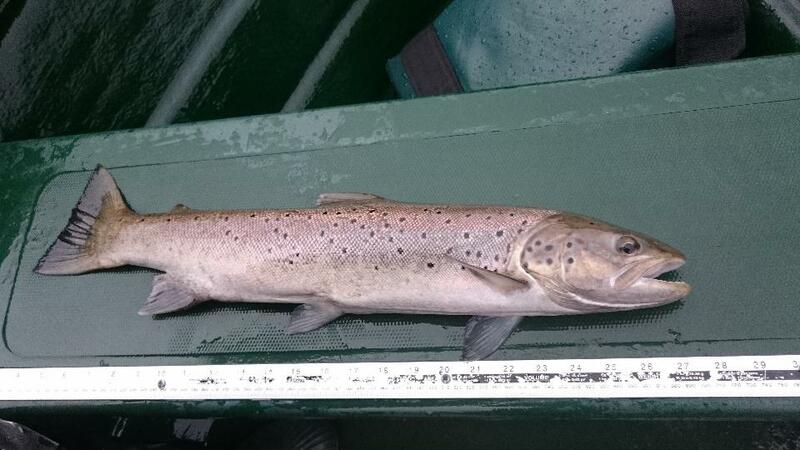 Last sea trout of the season caught today for member Bill Rankin, he said this one has been in for a while as it has reverted back to its natural state, two other decent trout caught after this and missed a much bigger fish later on. The fish were safely returned. There were only six members took part with only three members weighing in, the overall winner was Bill Rankin who weighed in two fish for 1lb 3oz, second was Allan Miller with two fish for 1lb 1oz and third was Keith McKenzie with one fish for 8ozs. Two DDAC committee members found these fish thrown into the bushes at the top end of Loch Eck . There was a bus load of so called “anglers” dropped of yesterday (13/10/2018) along the Loch from Jubilee Point up. They were all sitting under their green umbrellas after throwing out either worms or maggots. These fish were found in only one small spot, so what were the rest doing ? The last three days of very heavy rain made conditions exceedingly hard for members to fish the competition, Joe Docherty was up today (Tuesday) and never even got afloat as the loch was rising and put him in doubt of his ability to safely get the boat re-moored. He sent me these photos of the situation. Also here are a couple of photos of the River Massan looking very angry. The winner will be required to have caught and netted a salmonid(s) from Loch Eck. The ruling as for the Club Rivers i.e. Two Sea Trout – Catch & release thereafter. All salmon will be returned as per Club rules. Catch & Release – Sea Trout may be measured on length and returned, they can be recorded in the day book using the Weight / Length table supplied. The competition is fished either by bank or boat. The member must nominate their preferred day to fish within the set competition week when booking their boat. The best basket will be two or more fish. The form of angling is by any legal method. No treble hooks. The trophy will be awarded to the person who has caught the largest fish, measured on length, within the competition rules set above. A DDAC measuring stick is placed in each boat. It’s well over four long months till the salmon and seatrout season kicks off again in Cowal, so here’s a beautiful photo of Loch Eck just to wet members appetites. Thanks to explorecowal.com for the use of his image. Last day of the season on Loch Eck. A very wet visit to Loch Eck on Tuesday 31st October produced this fine Sea Trout for Bill Rankin who was accompanied by Allan Miller on the last outing of 2017.